High Desert Martial Arts Chief Instructor is Daniel Graff. He has been teaching students, ages four and up since 1998 and is driven by his passion for the Martial Arts and desire to share the immense benefits that it has to offer people of all ages. He is able to achieve this by implementing ancient philosophies, concepts and his unique teaching techniques that can help the beginner student learn the basic skills while helping the advanced student improve and excel. 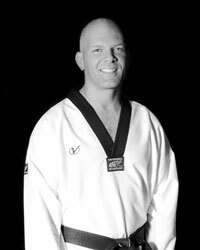 Master Graff is a 6th degree black belt with 20 years experience in the World Taekwondo Federation. He received the “Instructor of The Year” award from the Northwest Black Belt Association in 2006, 2008 and 2009. Master Graff is dedicated to the tenets of taekwondo: courtesy, integrity, perseverance, self-control and indomitable spirit as a teaching foundation to achieve a student’s full potential. Professor Daniel Graff holds a black belt in Brazilian Jiu-Jitsu with 16 years experience under Marcelo Alonso Team Carlson Gracie Brazilian Jiu-Jitsu. He provides instruction for both youth BJJ and adult BJJ. Professor Graff is dedicated to the BJJ sport and has a passion for teaching.